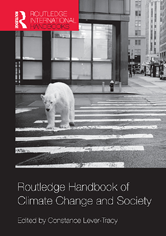 As the time-scales of natural change accelerate and converge with those of society, Routledge Handbook of Climate Change and Society takes the reader into largely uncharted territory in its exploration of anthropogenic climate change. Current material is used to highlight the global impact of this issue, and the necessity for multidisciplinary and global social science research and teaching to address the problem. The book is multidisciplinary and worldwide in scope, with contributors spanning specialisms including agro-forestry, economics, environmentalism, ethics, human geography, international relations, law, politics, psychology, sociology and theology. Their global knowledge is reflected in the content of the text, which encompasses chapters on American, European and Chinese policies, case studies of responses to disasters and of the new technological and lifestyle alternatives that are being adopted, and the negotiations leading up to the Copenhagen conference alongside a preface assessing its outcomes. Starting with an initial analysis by a leading climatologist, key issues discussed in the text include recent findings of natural scientists, social causation and vulnerability, media and public recognition or scepticism, and the merits and difficulties of actions seeking to mitigate and adapt.